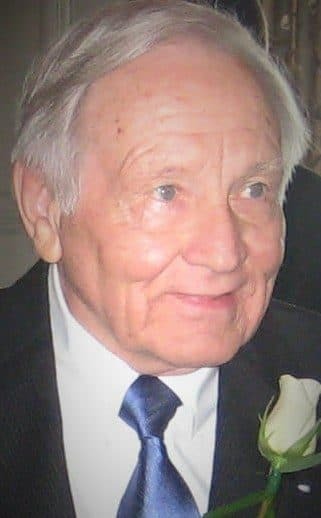 John H. Grogg, Jr., age 86, of Peachtree Corners, Georgia, died on February 28, 2019, with family by his side. He was born in Asheville, NC on March 19, 1932 to the late John H. Grogg and Lucy Arizona Freeman. Mr. Grogg, a devout Christian and consummate gentleman, was highly respected and loved by all who knew him. In earlier years, he served his church as a minister of music, deacon and elder. He lived his life based on Christian principles and lived his life by example. John was a proud veteran having served in the U.S. Army during the Korean War period. Following his military service, he spent 45 years in the precast, prestressed concrete industry until his retirement in 2000. Over the years he often rode by a building, bridge, stadium, or parking deck which his company had built, and smiled with pride as he shared a memory of his time in the business. He was an avid history buff and he was an aviation enthusiast, even obtaining his private pilot’s license and soaring the skies in this Cessna 150. John is preceded in death by his mother and father; sisters, Doris Grant and Glenna Crawford; son, John H. Grogg, III; wife of 44 years , Evelyn Braboy Grogg and his wife of 17 years, Christine Lamb Grogg. Mr. Grogg is survived by his daughters, Dana E. Grogg of Milton, GA, Tanya Grogg Martell (Bob) of Peachtree Corners, GA and two step-daughters, Linda Eastland of Bluffton, SC and Sandra Knight of Columbia, SC. He is also survived by 4 grandchildren, Douglas L. Sorrells, Jr. (Nicole), Kecia Edmondson (Chas), Kyle Boehmer (Vicky) and Dacy Johnson (Ryan), along with 8 great-grandchildren, Alexis Edmondson, Aaron Edmondson, James Boehmer, Alexander Boehmer, John Boehmer, Charlotte Sorrells, John Sorrells and Evelyn Johnson, as well as several nieces and nephews. John often said, “Anything worth doing is worth doing right”… and that is exactly how he lived his life! A graveside service will be held on Saturday, May 4, 2019 at 2 PM at Sharon Memorial Park, 5716 Monroe Road, Charlotte, NC where John’s ashes will be interred next to his late wife Evelyn. The family was assisted by Georgia Cremation, 3570 Buford Hwy #202, Duluth, GA (678) 584-0914. The family invites you to leave a message of condolence or share a fond memory of John H. Grogg, Jr. below.